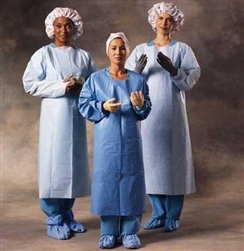 Kimberly Clark Impervious Gowns are medical procedure and isolation gowns that feature a plastic film outer layer and soft-to-the-touch inner lining quilted together in an attractive embossed pattern. The gowns offer impervious protection to fluids. They are blue in color. 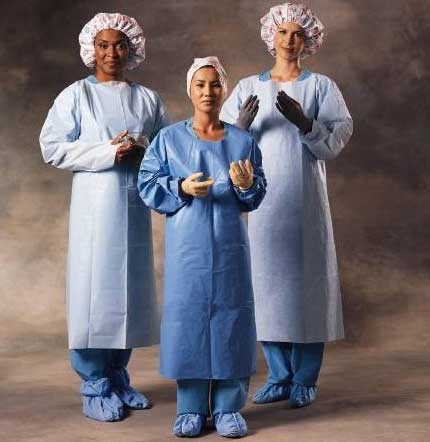 Kimberly Clark Impervious Gowns are polyethylene coated polypropylene. They are designed to be used where the potential for soaking and heavy fluid contact in front is anticipated. These medical gowns are disposable. They have long sleeves and feature a thumb loop to ensure the gown stay in place and wrists are covered after donning gloves. They have a waist tie for a customized fit and a perforated back. One size fits most. Kimberly Clark Impervious Gowns are non-sterile.